@Ken-Conrad The low-profile USB Type-A sockets are harder to find and thus more expensive than the regular kind. I could've designed my board with those, but I wanted to use components that are very easy and cheap to source. @Ken-Conrad About the mini-dock: I have an external CP2104-based USB-TTL, with no pull-up/pull-down resistors at all, which works perfectly well and fine with the Omega2. This leads me to believe that if there is a pull-down resistor on the mini-dock on UART0_RX, it is possibly the reason why it's not working. I suppose you could try poking around with a multimeter, until you find the pull-down resistor and then removing it. as long as we are talking defective hardware lets give a big shout out to the gps expansion. onion admits a fault in the unit and at the same times claims it's not their fault. yes, according to another poster onion claims gps expansion faults that they admit exist are not their fault. so good luck with the mini dock. i can confirm though that the expansion dock has a good serial connect if that interests you at all. @Douglas-Kryder Well, are you talking about the old expansion-dock for the Omega1, or the newer one for the Omega2? And if you're talking about the old one, does it match with the schematics at https://github.com/OnionIoT/Onion-Hardware/blob/master/Schematics/Omega-Expansion-Dock.pdf ? The Omega1 mini-dock these guys have doesn't match the schematics, so that's a problem. @WereCatf i was talking about the one released with the omega2 group of products. last edited by Luciano S. @Luciano S.
There was problems with resistor in serial circuit of old mini dock. But it works with Omega1. Since we never promise compatibility between old mini dock and new Omega2, there is nothing we can do about this. If you want to use Omega 2 with mini dock, I suggest that you can buy a mini dock 2 to solve this problem. You also never told us that you sell us broken hardware for the full price! And by the way, i was mentioning my problems i also had with the Omega1 setup and my mini-docks. I had to change hardware that i see the dock permanent when it is plugged in over USB. Onion.io just ignores such facts, not responding on question ppl make here or just do so if everything would be ok.
A normal client without a lot of technical readings knowledge just assumes that there is one version of a mini-dock ... a working , free of bugs, on. At least when he is paying 15.- Dollars and about 70% taxes on it (x2) !! It is really easy, the stupid client is always the one who is the idiot! How did you take this excellent photo (what kind of apparate, settings) please? If I understand well there can be at least two (or three?) Minidock versions. Which one is this? Firstly I'm partly sorry for reviving the old thread; but I've butted my head against this same problem. @onion can you fix your documentation so we can track these changes and make the necessary adjustments to our boards? Suggesting simply buying the mini dock 2 when there is no such item for sale isn't making this any less frustrating. I must admit I had completely forgotten about these things until I was looking to replace Hi-link RM04 modules, their next model was pretty much identical and I saw an opportunity to get my work to support the open source community ... but when I couldn't even get a serial connection going after an hour the powers to be pulled the plug. However I'd still like to sort this out for my own use. I borrowed the rewards from a friend who also backed the 2 and 2+ and his dock is identical to mine. Neither work. @bearer The Omega-Mini-Dock schematic is basically correct. 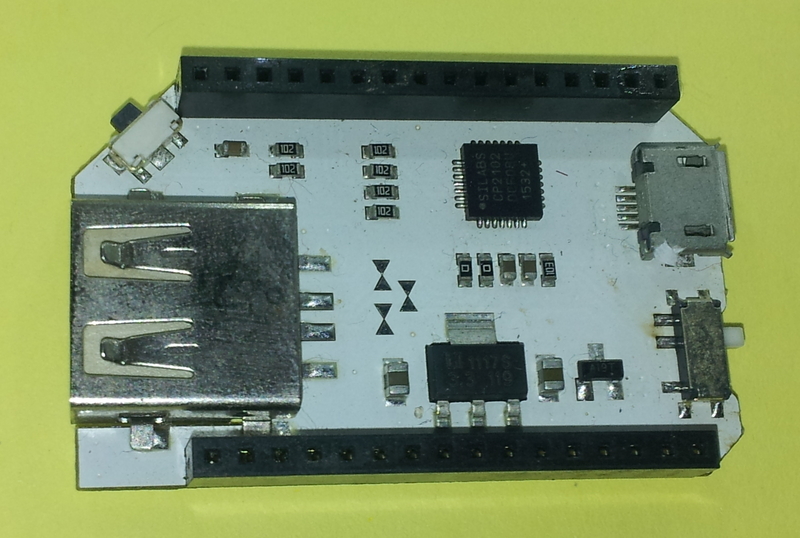 This can be the version2 board with original Omega header pinout (U5). For Omega2(+) one should replace U5 to a correct header pinout and change RXD, TXD to RX0, TX0 respectively. There are no TVS diodes (D12, D13, D14) on the Minidock. I hope all above info are correct but - as usual - make these modifications at your own risk. Do you want further background info? Thanks for the detailed reply. I went with option 3 and managed to fit some 0805 onto the 0603 pads and it works as expected. Thanks again.